Head on over here and answer one question and you can get a coupon for a FREE bottle of Excedrin mailed to your home (up to a $5.99 value). The trick to getting your coupon? Pick ANY pain reliever other than Excedrin. I selected only Tylenol and got the offer to pop up right away for me. 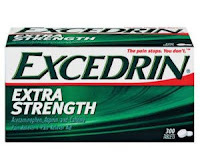 You can do this more than once and select Excedrin – you’ll get a coupon for $2.00/1.